Iridium has secured a launch for five more of its next-generation communications craft in a rideshare arrangement with two U.S.-German research satellites aboard a SpaceX Falcon 9 rocket by early 2018. The announcement Jan. 31 came two-and-a-half weeks after the first 10 Iridium Next satellites lifted off on a Falcon 9 booster from Vandenberg Air Force Base in California. Another 10 spacecraft are scheduled for launch on a Falcon 9 flight in April. Iridium will share the Falcon 9’s lift and volume capacities on the newly-announced mission — also due to launch from Vandenberg — with two gravity research probes jointly developed by NASA and the German Research Center for Geosciences, or GFZ, of Potsdam, Germany. The twin research satellites will replace the Gravity Recovery and Climate Experiment — GRACE — spacecraft in orbit since March 2002. 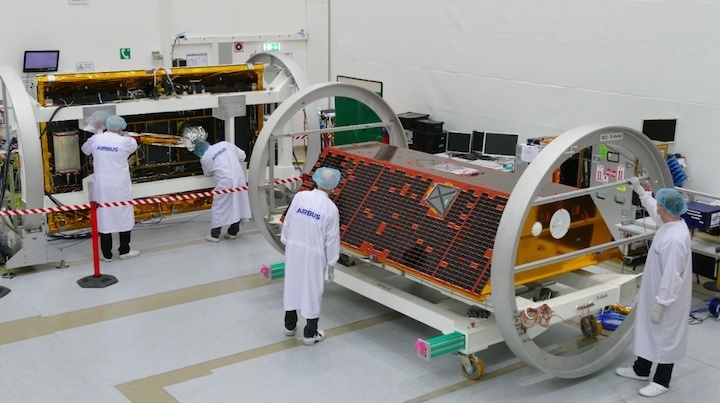 The GRACE-Follow On, or GRACE-FO, satellites are being built and tested in Germany by Airbus Defense and Space. NASA’s Jet Propulsion Laboratory is responsible for the overall mission — valued at nearly $400 million — and pays for the construction of the two GRACE-FO spacecraft and a microwave instrument, the centerpiece of the satellites’ science payload. The German government and GFZ are in charge of part of the science payload and arranging launch services for the GRACE-FO mission, roughly one-quarter of the project’s overall cost. The identical GRACE-FO satellites will launch into a polar orbit around 300 miles (500 kilometers) above Earth, and fly around the planet in formation separated by 137 miles (220 kilometers). The microwave ranging instrument will track the distance between the two spacecraft with a precision of 0.002 millimeters, a fraction of the width of a human hair. Changes in the range between the satellites will tell scientists about the strength and lumpiness of Earth’s gravity field, allowing the ground team to produce a global gravity map every 30 days through the mission’s expected five-year lifetime. GRACE’s data archive aids studies of earthquakes and other seismic activity, ocean currents and glaciers, and the structure of Earth’s interior. The original GRACE satellites are low on fuel, and could run out of propellant as soon as this summer, around the time the follow-on craft were originally scheduled for liftoff, according to GFZ. GFZ and NASA agreed in 2013 to launch the satellites on a Russian-Ukrainian Dnepr rocket provided by Kosmotras in August 2017, but that program’s future is in doubt after relations between the two partner countries deteriorated following Russia’s annexation of Crimea in 2014. Iridium also booked two satellites to launch on a separate Dnepr rocket, but the Virginia-based communications company is no longer counting on the converted Soviet-era missile’s availability for the mission. The indefinite grounding of Dnepr left Iridium and GFZ looking for an alternate ride. Iridium said the rideshare launch with SpaceX offered a “particularly compelling economical solution” through cost-sharing with GFZ. “This is a very smart way to get additional Iridium Next satellites into orbit,” said Matt Desch, CEO at Iridium. “This launch provides added resiliency to our network for not much more than we had planned originally to launch 72 satellites, including two with Kosmotras. “We are pleased to be sharing a rocket with NASA and GFZ German Research Center for Geosciences for this additional SpaceX launch, and GFZ has been a great business partner throughout this process,” Desch said in a statement. Financial terms of the rideshare SpaceX launch contract were not disclosed. GFZ said the agreement with SpaceX calls for a launch between December 2017 and February 2018. Iridium’s satellite contractors — Thales Alenia Space and Orbital ATK — are building 81 spacecraft for the new-generation fleet, which replaces the company’s aging satellites in orbit since the late 1990s. Iridium booked seven Falcon 9 launches with SpaceX in 2010 — enough to put 70 satellites into orbit — and the latest contract adds five more to that number. Launch arrangements for the remaining six satellites, considered ground spares, will be announced at a later date. Desch has said previously that Iridium intends to eventually launch all 81 of the satellites. Iridium’s network requires 66 satellites in space spread out in six orbital planes. The rest of the satellites launched will be stored in orbit. Airbus Defense and Space is building a multi-satellite adapter to accommodate the dual-launch, according to GFZ. SpaceX builds the dispenser for the Iridium satellites. 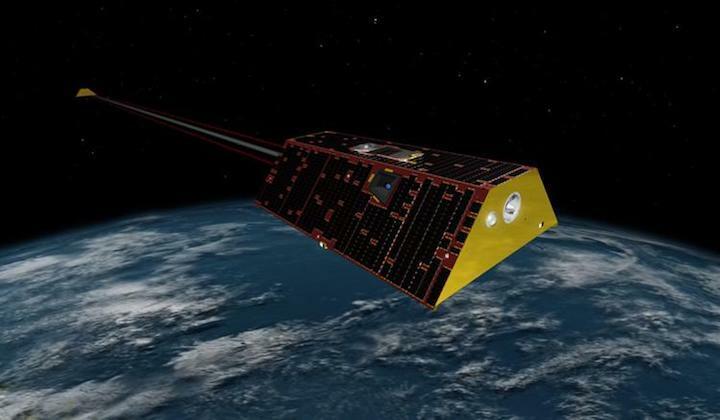 On March 17, 2002, the twin satellites of the NASA/German Gravity Recovery and Climate Experiment (GRACE) were launched in order to make precise measurements of the Earth´s gravity field. GRACE has lasted three times as long as originally planned for more than 15 years. Now it has ended science operations. Following the age-related failure of a battery cell on one of GRACE's two satellites, GRACE-2, contact was lost already in September. There are 20 battery cells on each satellite, and GRACE-2 had previously lost seven other cells and was critically low on fuel. Mission managers were able to restore communications with the spacecraft, and analyses revealed the battery had recovered its full voltage. The mission team made plans for one final science collection beginning in mid-October, when the satellites would be in full view of the Sun. Since then, GRACE-2 has periodically hibernated when there was insufficient Sun to power the instruments. On Oct. 12, as the team prepared to resume science data collection, it became apparent that even with the help of full-Sun conditions, the remaining battery capacity on GRACE-2 would not be sufficient to reliably operate its science instruments and telemetry transmitter. The mission's Joint Steering Group comprised of all U.S./German mission partners (NASA's Jet Propulsion Laboratory, Pasadena, California, Deutsches Zentrum für Luft- und Raumfahrt (DLR, the German Aerospace Center) and the Helmholtz Centre Potsdam - GFZ German Research Centre for Geosciences) made a decision and announced GRACE-2 will be decommissioned. Since both satellites are required to make the science measurements, the loss of GRACE-2 means GRACE will no longer be able to continue its dual satellite science mission. "We look back with pride and gratitude on the GRACE mission" says Prof. Dr. Reinhard Hüttl, Scientific Executive Director and Chairman of the Board at the GFZ. "During the 15 years of the mission operation, the satellite tandem has measured the gravity field of the Earth and its variations in a highly precise manner, which helps us, for example, to accurately document changes in groundwater storage or in glacial retreat. Furthermore, the resulting influence on sea level rise can be detected thanks to the GRACE measurements. The mission has, thus, substantially contributed to a better understanding of the system Earth." Since 2010, GRACE's multi-national mission operations and science data analysis teams have overcome numerous technical challenges and developed innovative methods to work around the limitations imposed by aging batteries and limited fuel for flight control to allow the mission to continue to provide its valuable data more than 10 years beyond its intended lifetime. GRACE-2 is currently orbiting at 305.3 kilometers above Earth, 655 kilometers ahead of and 1,3 kilometers below GRACE-1. With GRACE-2 out of fuel, atmospheric drag on the satellite will increase the separation distance and lower GRACE-2's altitude relative to GRACE-1. There is no risk of a collision with GRACE-1, and GRACE-2's orbital altitude does not pose a hazard to other operational satellites. GRACE-2 will be safely deorbited and is expected to reenter the atmosphere and burn up by mid-to-late November. A few small pieces are expected to survive reentry and reach the ground, but the risk they pose to anyone is minimal and well within NASA requirements for satellite reentry and orbital debris. Operations of GRACE-1 will continue, with all of its remaining fuel being used to complete a series of accelerometer calibration maneuvers that will be used to improve the scientific return and insights from the 15 year record left by GRACE. All mission activities involving GRACE-1 will be completed by the end of the year, followed by decommissioning of GRACE-1 and atmospheric reentry in early 2018. NASA and the German Space Operations Center will jointly monitor both GRACE satellites as they deorbit and reenter the atmosphere. "The GRACE Mission Operations Team composed of DLR/GSOC, Airbus Defense and Space GmbH, JPL, University of Texas and GFZ has done a superb job to extend the nominal mission life time by more than a factor of three", says Prof. Frank Flechtner, co-principal investigator at GFZ. "It is of course a great pity that the monthly observation of mass transport in system Earth has ended after 15 and a half years. However, we now look forward to a successful launch of the successor tandem mission GRACE Follow-on in early 2018. It promises even more precise measurements of the Earth's gravity field due to an innovative Laser Ranging Interferometer, a technology demonstrator for next generation gravity missions developed by a German/American joint collaboration, and will thus yield further important contributions to Earth system science." The principle of the mission: Each of the twin GRACE satellites operates by transmitting microwave signals that are received by the other GRACE satellite. The timing of the received signals is used to precisely measure the small accelerations and decelerations caused by changing mass on the Earth below the spacecraft, which alter the distance between them very slightly. GRACE's monthly maps of regional variations in global gravity over the past 15-plus years have shown how water, ice and solid Earth material on or near Earth's surface has moved. Wenn über GRACE berichtet wird, fällt oft das Wort „revolutionär“. Seit das deutsch-amerikanische Satelliten-Duo am 17. März 2002 angefangen hat zu senden, haben die Daten des „Gravity Recovery and Climate Experiments“ (GRACE) den Blick der Wissenschaft auf die Bewegung des Wassers und auf Grundwasserspeicher grundlegend verändert. „GRACE hat es uns ermöglich, mittels der Beobachtung von Massenverlagerungen nachzuverfolgen, wie Wasser sich im Untergrund verhält“, sagt Reinhard Hüttl, Vorstandsvorsitzender und Wissenschaftlicher Vorstand des Deutschen GeoForschungsZentrums GFZ. „Dieser Bereich war der Weltraum-gestützten Fernerkundung davor nicht zugänglich“, so Hüttl weiter, „und das hat uns neue Möglichkeiten eröffnet, Klimaveränderungen zu beobachten und zu quantifizieren.“ Das GFZ betreibt die Satellitenmission zusammen mit dem Deutschen Zentrum für Luft- und Raumfahrt (DLR) und auf amerikanischer Seite mit dem Jet Propulsion Laboratory (JPL) der US-Raumfahrtbehörde NASA. Wie viele Revolutionen begann GRACE mit einem radikalen Gedanken: „Die völlig neue Idee bei GRACE war, dass man Messungen der Masse nutzen könnte, um Informationen über das System Erde zu gewinnen“, sagt der leitende Wissenschaftler Byron Tapley vom Center for Space Research der University of Texas (UTCSR) in Austin. Massenverlagerungen zu verfolgen war der Schlüssel zu einem besseren Verständnis dafür, wie Wasser und die feste Erde sich im Untergrund verhalten, wo niemand hinsehen kann. Je größer die Masse eines Objektes ist, desto größer ist auch dessen Anziehungskraft. So üben die Alpen beispielsweise eine höhere Anziehungskraft aus als die norddeutsche Tiefebene. Die winzigen Unterschiede merkt kein Mensch, aber Satelliten können die Veränderung messen. Wenn sie die Erde umkreisen und auf über eine massereiche Region fliegen, dann beschleunigen sie minimal, wenn sie darauf zufliegen, und werden langsamer beim Wegfliegen. Der weitaus größte Teil der Erdanziehungskraft rührt von der Masse im Erdinneren. Ein winziger Bruchteil allerdings geht auf das Wasser auf oder nahe der Oberfläche zurück. Ozeane, Flüsse, Seen, Gletscher und Grundwasser verändern sich viel rascher als das zähflüsssige Gestein im Erdinneren, denn sie reagieren auf Jahreszeiten, Stürme, Dürren oder andere Wettereffekte. GRACE entstand nun aus der Erkenntnis, dass die daraus resultierenden winzigen Schwerkraftänderungen aus dem All zu messen seien und so die Geheimnisse des Wasserkreislaufs lüften könnten. Das Prinzip: GRACE misst die Massenveränderungen, indem es deren Effekt auf das Satelliten-Duo aufzeichnet, das mit 220 Kilometer Abstand hintereinander unseren Planeten umkreist. Wird ein Satellit schneller, weil er als erstes auf ein massereiches Objekt zufliegt, vergrößert sich der Abstand um den Bruchteil einer Haaresbreite. Mittels Mikrowellen können diese Änderungen gemessen werden: Die Satelliten senden sich wechselseitig Pulse zu und registrieren, wann die Wellen zurückgestrahlt werden. Hinzu kommen GPS-Sensoren an Bord sowie Beschleunigungsmesser, um die Überflughöhe zu bestimmen und Bremseffekte zu erkennen, die etwa durch Reibung an atmosphärischen Teilchen entstehen. Aus all diesen Daten errechnen die Forscherinnen und Forscher monatliche Karten der regionalen Änderungen der Erdanziehungskraft und der daraus resultierenden Veränderungen der Massen an der Oberfläche. “Als die NASA diese komplexe Hochpräzisionsmission für ihr Earth System Science Pathfinder-Programm auswählte und ich Ende der 1990-er Jahre ins GRACE-Projekt kam, hatte ich schon meine Zweifel, ob mit GRACE jemals monatliche Schwerefeldkarten produziert werden”, erinnert sich Frank Flechtner vom GFZ. Er war als deutscher GRACE-Projektmanager eingestiegen und ist heute einer der beiden leitenden Wissenschaftler bei GRACE. Er folgte in dieser Funktion auf Christoph Reigber, den ursprünglichen “Co-Principal Investigator” und früheren Direktor des GFZ-Departments Geodäsie. “Schon gar nicht dachte ich, dass wir so lange Zeitreihen erhalten würden”, fügt Flechtner hinzu. Der Erfolg rühre aus der engen und sehr glatt verlaufenden deutsch-amerikanischen Zusammenarbeit, sagt Flechtner. Die beteiligten Partner sind NASA, UTCSR, das DLR, Airbus Defense and Space in Friedrichshafen und das GFZ. Die GRACE-Satelliten wurden in Deutschland bei Airbus D&S gebaut. Auftraggeber war das JPL der NASA in Pasadena, Kalifornien. Die Mission wird von Oberpfaffenhofen aus gesteuert, wo das DLR ihr Raumfahrtkontrollzentrum GSOC (German Space Operations Center) betreibt. Gestartet wurde GRACE von einer russischen Rockot-Rakete. Das GFZ ist in mehrfacher Hinsicht an der Mission beteiligt: Es ist Teil des GRACE Science Data Systems mit den Partnern bei JPL und UTCSR, es trägt mit seiner Satellitenempfangsstation auf Spitzbergen zur Steuerung des Missionsbetriebs bei und es stellt den stellvertretenden “Mission Operations Manager“, derzeit Heiner Massmann. Die Finanzierung des Missionsbetriebs wird getragen durch GFZ, DLR und durch ein Programm der europäischen Raumfahrtagentur ESA (Third Party Mission Programme). Grundwasserbeobachtung: In Böden und wasserführenden Gesteinsschichten (Aquiferen) gespeichertes Grundwasser wird weltweit nur selten gemessen. Der Hydrologe Matt Rodell vom Goddard Space Flight Center der NASA in Greenbelt, Maryland (USA) schrieb seine Doktorarbeit über die Möglichkeiten, GRACE-Daten hydrologisch zu nutzen. “Vor dem Satellitenstart hätte niemand gedacht, dass GRACE helfen könnte, den Raubbau an Grundwasserressourcen zu dokumentieren”, sagt Rodell. Doch in den letzten zehn Jahren haben Rodell, Jay Famiglietti (JPL) und andere mehr und mehr Aquifere identifiziert, die von Menschen rascher entleert werden als sie sich erneuern können. 2015 publizierte Famiglietti gemeinsam mit Kollginnen und Kollegen eine Übersicht, die zeigte, dass weltweit ein Drittel der größten Grundwasserbecken dramatisch übernutzt werden. Hochwasservorhersage: Systeme zur Prognose von Überflutungen brauchen Informationen in nahezu Echtzeit (near-real time oder NRT), um die Entstehung und Entwicklung von Flutwellen abschätzen zu können. Für große Einzugsgebiete ergeben sich so Vorwarnzeiten von einigen Tagen. Die EU fördert das Projekt EGSIEM (European Gravity Service for Improved Emergency Management), um genau solche NRT-Daten zum Schwerefeld und korrespondierende Flutindikatoren zusammenzuführen. Dies soll innerhalb des Zentrums für Satellitengestützte Kriseninformationen (ZKI) am DLR geschehen. Der Testbetrieb wird am 1. April beginnen. Eisschilde und Gletscher: Die Antarktis ist ein extrem unwirtlicher Ort, um Daten zu sammeln, und Grönland ist nicht viel besser. Gleichwohl müssen wir wissen, wie schnell die Eisschilde dort abschmelzen, um die Schwankungen des Meeresspiegels weltweit besser zu verstehen. Forschende, die sich mit der Kryosphäre befassen, gehörten zu den Pionieren bei der Nutzung von GRACE-Daten. Es stellte sich schnell heraus, dass der Massenverlust sowohl auf Grönland als in der Antarktis weitaus dramatischer war als vorher angenommen. Seit dem Start von GRACE hat Grönland 280 Milliarden Tonnen Eis pro Jahr verloren, die Antarktis rund 120 Milliarden Tonnen. Ingo Sasgen vom GFZ (heute beim Alfred-Wegener-Institut für Polar- und Meeresforschung in Bremerhaven) hat zusammen mit seinem GFZ-Kollegen Henryk Dobslaw und anderen gezeigt, wie jahreszeitlichen Schwankungen des Schneefalls und die damit verbundene Massenzunahme auf der Antarktischen Halbinsel mit der Stärke eines Tiefdrucksystems über der Amundsensee zusammenhängen. Dieses Tiefdruckgebiet wiederum ist mit dem tropischen La-Niña-Phänomen (dem Gegenstück zu El Niño) verknüpft. So haben GRACE-Daten erstmals ermöglicht, den Effekt von atmosphärischen “Telekonnektionen”, die das Klima der Tropen sogar mit entlegenen Regionen wie der Antarktis verbinden, zu quantifizieren. Mehr Informationen dazu finden Sie hier. GRACE-Daten zeigen jedoch auch den Massenverlust von Inlandsgletschern in vielen Bergregionen weltweit. Das geht einher mit einer Gefährdung der Wasserversorgung in den Bergen vorgelagerten Gebieten. So hat ein internationales Team von Forschenden unter der Leitung der GFZ-Wissenschaftler Daniel Farinotti und Andreas Güntner anhand von GRACE-Daten abgeschätzt, dass das Tian Shan-Gebirge derzeit jährlich doppelt so viel Eis verliert wie ganz Deutschland an Wasser pro Jahr verbraucht. Gekoppelt an ein glaziologisches Modell ergaben die Daten, dass die Hälfte allen Gletschereises des Tian Shan im Jahr 2050 verschwunden sein könnte. Die Originalstudie finden Sie hier, die Pressemitteilung dazu hier. Ozeandynamik: Das Meerwasser erwärmt sich und dehnt sich daher aus. Hinzu kommen die erhöhten Zuflüsse aus den Gletscherregionen und Eisschilden der Erde. Beides trägt zum Anstieg der Meeresspiegel weltweit bei. Zwar gibt es seit 1992 hochpräzise Meeresspiegelmessungen über die US-französische Topex-Poseidon- und die folgenden Jason-Missionen, aber diese zeigen nur die gesamten Höhenänderungen der Meeresoberfläche an. Um nun herauszufinden, ob sich die (temperaturbedingte) Ausdehnung des Wassers oder schmelzendes Eis oder der Zufluss von Land mehr auf diese Änderungen auswirkt, muss man die Massenverteilung des Wassers untersuchen. Genau das hat Inga Bergmann vom GFZ mit GRACE-Daten für den antarktischen Zirkumpolarstrom getan. Gemeinsam mit Henryk Dobslaw gelang es ihr, sogar Schwankungen in Zeiträumen von weniger als einem Monat zu dokumentieren. Damit eröffnete sie einen weit besseren großräumigen Blick auf die Dynamik der weltweit stärksten Meeresströmung als bisherige Messungen vor Ort ergeben hatten. Hier geht es zur Originalstudie. Änderungen der festen Erde: Als Reaktion auf die Veränderung der Masse des oberflächennahen Wassers bewegt sich sogar der zähflüssige Mantel unter der Erdkruste, wenn auch nur um Winzigkeiten. Eine Gruppe von GRACE-Nutzern berechnet diese Verschiebungen für ihre Forschung. Kürzlich haben Surendra Adhikari und Erik Ivins vom JPL Daten von GRACE genutzt, um zu ermitteln, wie nicht nur der Verlust der Eisschilde, sondern auch der Schwund des Grundwassers die Erdrotation verändert haben, weil sich das System diesen Massebewegungen anpasst. Die Planer von GRACE hatten wenig Hoffnung, dass die Mission dazu führen könnte, die abrupten Masseänderungen im Zusammenhang mit Erdbeben präzise bestimmen zu können. Das liegt an den unterschiedlichen Skalen: Erdbeben treten plötzlich und lokal auf, während die monatlichen GRACE-Karten durchschnittlich eine Fläche doppelt so groß wie Bayern und eben einen ganzen Monat abbilden. Dennoch haben die Forscher neue Datenverarbeitungs- und Modellierungstechniken entwickelt, um die Erdbebeneffekte herauszudestillieren. „Wir sind in der Lage, die unmittelbaren Masseverschiebungen in einem Erdbeben zu messen und wir haben dabei herausgefunden, dass es eine messbare Entspannung bis zu ein bis zwei Monate nach dem Beben gibt“, sagt der leitende Wissenschaftler bei GRACE, Byron Tapley. Diese Messungen eröffnen bisher nicht gekannte Einsichten in das Geschehen weit unter der Erdoberfläche. Atmosphärenbeobachtung: Das zweite wissenschaftliche Ziel der GRACE-Mission ist es, unter Nutzung der GPS-Radio-Okkultations-Technik (RO) täglich über 150 sehr präzise weltweit verteilte vertikale Temperatur- und Feuchtigkeitsprofile zu erhalten. „Diese Messungen sind von größtem Interesse für Wetterdienste und Studien zum Klimawandel. Daher stellen wir diese Profile spätestens 2 Stunden nach Messung durch einen der GRACE-Satelliten den führenden Wetterzentren der Welt auf einer 24/7-Basis bereit, wie z.B. ECMWF (European Center for Medium-Range Weather Forecasts), MetOffice, MeteoFrance, NCEP (National Centers for Environmental Predictions) oder dem DWD (Deutscher Wetterdienst), um deren globale Vorhersagen zu verbessern“, sagt Jens Wickert, RO-Manager am GFZ. Mit 15 Jahren hat GRACE dreimal so lange wie ursprünglich geplant funktioniert. Die Projektmanager haben alles getan, um ihr Leben zu verlängern, aber das Satelliten-Duo wird demnächst seine Treibstoffvorräte aufgebraucht haben – vermutlich in diesem Sommer. Die NASA und das GFZ haben seit 2012 an einer Nachfolge-Mission, GRACE Follow-On (GRACE-FO), gearbeitet, wobei Deutschland erneut die Trägerrakete und die Missionssteuerung bezahlt. Die Zwillings-Satelliten wurden, wieder im Auftrag von JPL, bei Airbus D&S in Deutschland gebaut. Es ist geplant, dass GRACE-FO zwischen Dezember 2017 und Februar 2018 an den Start geht. Die neue Mission konzentriert sich auf die Fortsetzung der erfolgreichen GRACE-Zeitreihen. Die neuen Satelliten werden eine ähnliche Hardware wie GRACE benutzen, sollen aber außerdem eine Technologie demonstrieren, die ein neuartiges Laser Ranging Interferometer (LRI) benutzt, um die Distanz zwischen beiden Satelliten zu überwachen. Das LRI ist eine deutsch-amerikanische Entwicklung, die das Potenzial hat, noch genauere Intersatelliten-Messungen und daraus resultierende Schwerkraftkarten zu produzieren. Da die GRACE-FO Mission das revolutionäre Erbe von GRACE fortsetzen wird, sind aus ihr sicherlich weitere innovative Erkenntnisse zu erwarten. Das Wichtigste ist aber, dass die Forschenden weiterhin Veränderungen in unseren kostbaren globalen Wasserressourcen überwachen können. Climate Experiment Follow-On) satellites will soon travel to their launch site in California. December to begin final launch preparations. monthly movement of liquid water, ice and the solid Earth. to last at least five years. ionosphere on a daily basis to aid weather forecasting. satellites that have been capable of monitoring the transport of mass within the Earth system. polar ice melt to sea level rise. GRACE and collect essential climate variables. Am 12. Dezember 2017 hat das Satelliten-Duo GRACE Follow-On (GRACE FO) seinen ersten Schritt zur Reise in die Erdumlaufbahn gemacht. Es flog heute per Luftfracht in die USA, wo es im Frühjahr 2018 von der Luftwaffenbasis Vandenberg in Kalifornien ins All starten wird. GRACE FO wird das Schwerefeld der Erde vermessen, um so mit anderen Methoden nicht nachweisbare Bewegungen von Wasser, Eis und Landmassen – Indikatoren des Klimawandels – zu überwachen. Mit an Bord ist ein am Max-Planck-Institut für Gravitationsphysik (Albert-Einstein-Institut; AEI) entwickelter Technologiedemonstrator, der die Messung noch genauer machen soll. Zum Einsatz kommt dabei eine für das zukünftige Weltraum-Gravitationswellen-Observatorium LISA entwickelte und in LISA Pathfinder getestete Technologie. GRACE Follow-On (Gravity Recovery and Climate Experiment Follow-On) ist eine gemeinsame amerikanisch-deutsche Satelliten-Mission des NASA Jet Propulsion Laboratory (JPL) in Pasadena (Kalifornien) und dem deutschen GeoForschungszentrum (GFZ) in Potsdam. Die Satelliten wurden von Airbus in Friedrichshafen gebaut. Die Mission besteht aus einem Satelliten-Tandem in einer niedrigen polaren Erdumlaufbahn. Die Satelliten vermessen ihren gegenseitigen Abstand von rund 220 Kilometer hochpräzise auf Nanometer genau. Sowohl die örtlichen Details als auch die zeitlichen Veränderungen des irdischen Schwerefeldes lassen sich aus den Schwankungen dieser Abstände ableiten. Diese Veränderungen im Erdschwerefeld wiederum können genutzt werden, um Indikatoren des Klimawandels zu messen. Dazu zählen beispielsweise das Abschmelzen der polaren Eismassen und Veränderungen im Grundwasserpegel. GRACE Follow-On wird ein Tandem aus zwei Satelliten sein, die die Erde in einem gegenseitigen Abstand von 220 Kilometern auf der gleichen Bahn in 490 Kilometer Höhe über dem Erdboden umrunden. Die Mission wird den Abstand zwischen den Satelliten mit Mikrowellen (blau) und einem neuen Laserinterferometer (rot) vermessen. GRACE Follow-On setzt die erfolgreiche GRACE-Mission (2002-2017) fort. Zudem wird das zuvor verwendete Messprinzip der Abstandsmessung mittels Mikrowellen um ein Laserinterferometer erweitert und damit auf Nanometer-Genauigkeit verbessert. Das Laserinterferometer fliegt als Technologie-Demonstrator auf der Satellitenmission mit und ist eine gemeinsame Entwicklung von JPL und AEI Hannover. Das AEI ist verantwortlich für den deutschen Beitrag zum Laserinterferometer und überwacht dessen technische Umsetzung durch SpaceTech GmbH und DLR. Dies beinhaltet insbesondere die Optik mit dem Steuerspiegel, der den Laserstrahl zum entfernten Satelliten zurückschickt..
Um aus dem im Weltall gemessenen Lasersignal den Abstand der Satelliten präziser als jemals zuvor zu ermitteln, kommt eine am AEI für das zukünftige Weltraum-Gravitationswellen-Observatorium LISA entwickelte Technologie zum Einsatz. Die für LISA entwickelte Messtechnik wurde an die Anforderungen der GRACE-FO-Mission angepasst und ist eine wissenschaftliche Premiere: Erstmals wird ein Laserinterferometer zwischen entfernten Satelliten aufgespannt und zur Längenmessung eingesetzt. On 12th December the twin satellites GRACE Follow-On (GRACE FO) have made their first step towards earth orbit. They flew by air freighter to the USA, where they will be launched into space from Vandenberg Air Force Base in early 2018. GRACE FO will measure the Earth‘s gravitational field to observe otherwise inacessible movements of water, ice, and land masses, which are indicators of climate change. One new component on board is a technology demonstrator developed at the Max Planck Institute for Gravitational Physics (Albert Einstein Institute; AEI). It will make the measurements even more precise and uses technology developed for the future space-based gravitational-wave detector LISA, which was tested in LISA Pathfinder. GRACE Follow-On (Gravity Recovery and Climate Experiment Follow-On) is a joint US-German satellite mission of NASA‘s Jet Propulsion Laboratory (JPL) in Pasadena (California) and the German Research Centre for Geosciences (GFZ) in Potsdam. The satellites were built by Airbus in Friedrichshafen. The mission consists of a satellite tandem in a low polar Earth orbit. The satellites measure their distance of about 220 kilometers to a precision of nanometers. Not only the local structure of the gravitational field but also its temporal change can be derived from the inter-satellite distance measurements. These changes of the gravitational field can in turn be used to measure indicators of climate change. These include the melting of polar ice caps and changes in subsoil water levels. GRACE Follow-On continues the successful GRACE mission (2012-2017). Additionally, the previously used distance measurement method by microwaves will be extended by a laser interferometer, which will improve the precision to the nanometer level. The laser interferometer is a technology demonstrator onboard the satellite mission. It is a joint development by JPL and AEI Hannover. The AEI is responsible for the German part of the laser interferometer and supervises its technical realization by SpaceTech GmbH and DLR. This especially includes the optics with the steering mirror that sends the laser beam back to the distant satellite. To measure the inter-satellite distance in space more precise than ever with laser light, a technology developed at the AEI for the future space-based gravitational-wave detector LISA is employed. The measurement technology developed for LISA was adapted to the requirements of the GRACE FO mission. It also is a scientific premiere: For the first time a laser interferometer between distant satellites is used for length measurements. A pair of advanced U.S./German Earth research satellites with some very big shoes to fill is now at California's Vandenberg Air Force Base to begin final preparations for launch next spring. 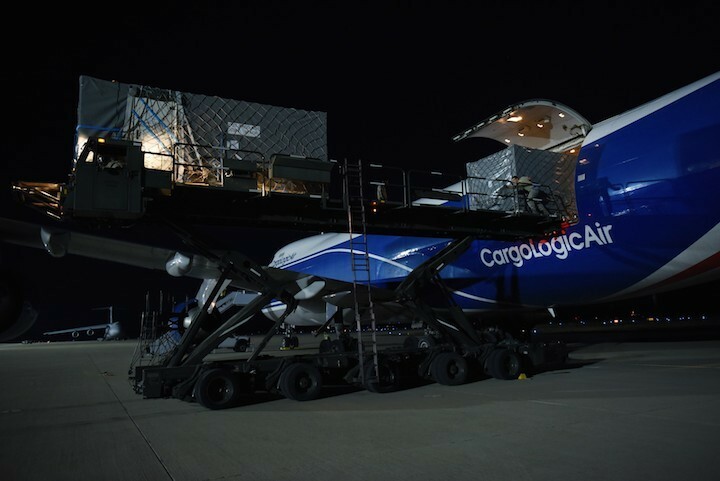 Following a year-long test campaign by satellite manufacturer Airbus Defence and Space at IABG in Ottobrunn, near Munich, Germany, the twin Gravity Recovery and Climate Experiment Follow-On (GRACE-FO) satellites were loaded aboard an air freighter at Munich airport Dec. 11 and arrived at the launch site on California's central coast Tuesday, Dec. 12. GRACE-FO will provide continuity to the Earth climate data record of the extremely successful predecessor GRACE, which completed its science mission in October after more than 15 years in orbit. GRACE-FO will extend GRACE's legacy of scientific achievements, which range from tracking mass changes of Earth's polar ice sheets and estimating global groundwater changes, to measuring the mass changes of large earthquakes and inferring changes in deep ocean currents, a driving force in climate. To date, GRACE observations have been used in more than 4,300 research publications. Its measurements provide a unique view of the Earth system and have far-reaching benefits to society, such as providing insights into where global groundwater resources may be shrinking or growing and where dry soils are contributing to drought. 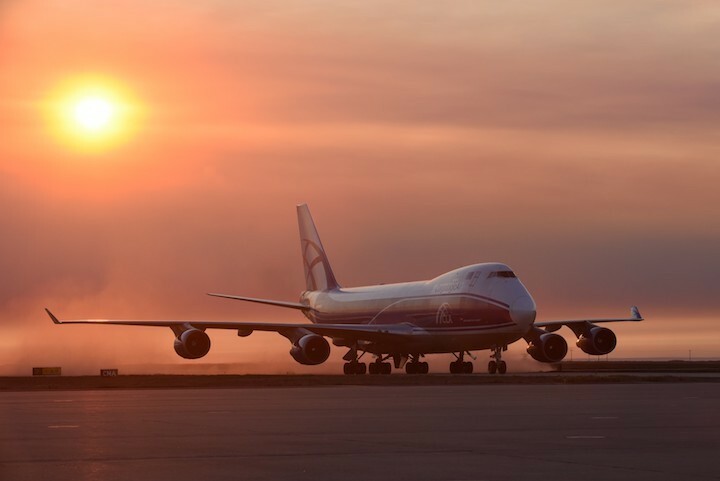 GRACE-FO is planned to fly at least five years. 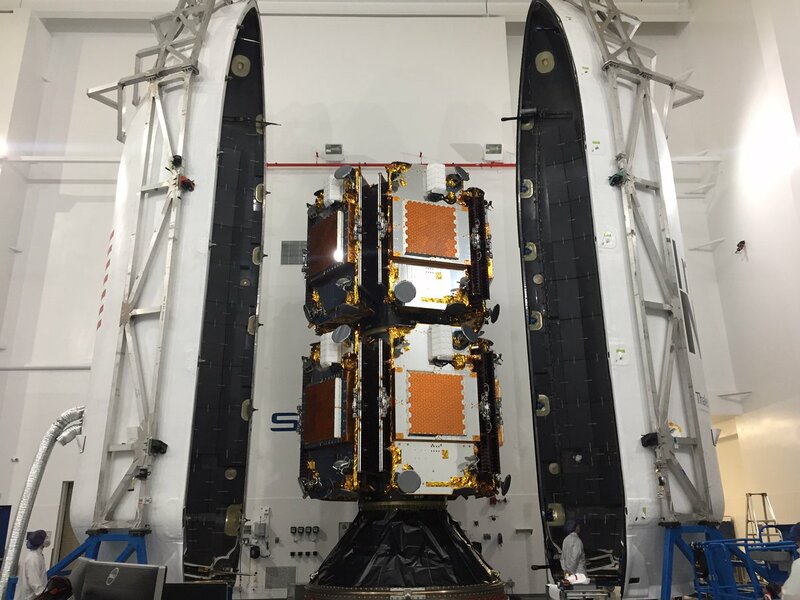 The GRACE-FO spacecraft will undergo final tests before being integrated atop a SpaceX Falcon 9 rocket, where they will share a ride to space with five Iridium NEXT communications satellites. "With this milestone, we are now in position to launch GRACE Follow-On and restart the valuable observations and science that ceased in mid-2017 with the end of the GRACE science mission," said Michael Watkins, director of NASA's Jet Propulsion Laboratory in Pasadena, California, and GRACE Follow-On science team lead. After a few months of in-orbit checkout, GRACE-FO will track changes in the distribution of liquid water, ice and land masses by measuring changes in Earth's gravity field every 30 days. GRACE-FO will essentially measure how much mass is gained or lost each month on the continents, in the oceans, and in the ice sheets. These data will improve scientific understanding of Earth system processes and the accuracy of environmental monitoring and forecasts. Terrestrial water cycle processes, such as precipitation, droughts, floods, changes in ice sheets and land glaciers, evaporation from the oceans, and groundwater use and storage. Tectonic processes, such as earthquakes and variations in Earth's lithosphere (the rigid outer layer of our planet that includes the crust and upper mantle) and mantle density. The GRACE-FO satellites will be launched into a polar orbit at an altitude of about 311 miles (500 kilometers). Flying 137 miles (220 kilometers) apart, the satellites will use a JPL-built microwave ranging system to take continuous, very precise measurements of the variations in the distance between each other. These variations are caused by minute changes in the gravitational pull on the satellites from local changes in Earth's mass below them. The microwave ranging data are combined with GPS tracking for timing, star trackers for attitude information, and an accelerometer built at ONERA in France to account for non-gravitational effects, such as atmospheric drag and solar radiation. From these data, scientists will calculate how mass is redistributed each month and monitor its changes over time. Each satellite will also carry an instrument called an atmospheric limb sounder that will provide an innovative and cost-effective technique to measure how much signals from GPS satellites are distorted by the atmosphere. The sounders will provide up to 200 profiles of atmospheric temperature and water vapor content each day to aid weather forecasting. While similar to their predecessor GRACE satellites, GRACE-FO incorporates design upgrades gleaned from 15 years of GRACE operations that will improve satellite performance, reliability and mission operations. 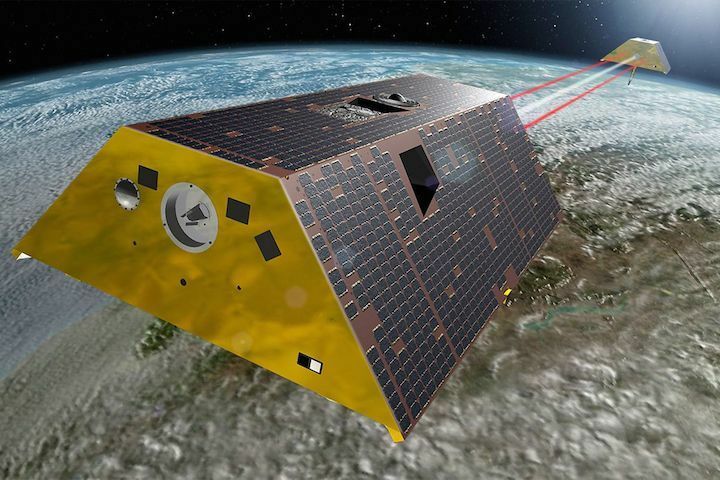 GRACE-FO will also fly a new, more precise inter-satellite laser ranging instrument, developed by a German/American joint venture, which will be tested for use in future generations of GRACE-like missions. 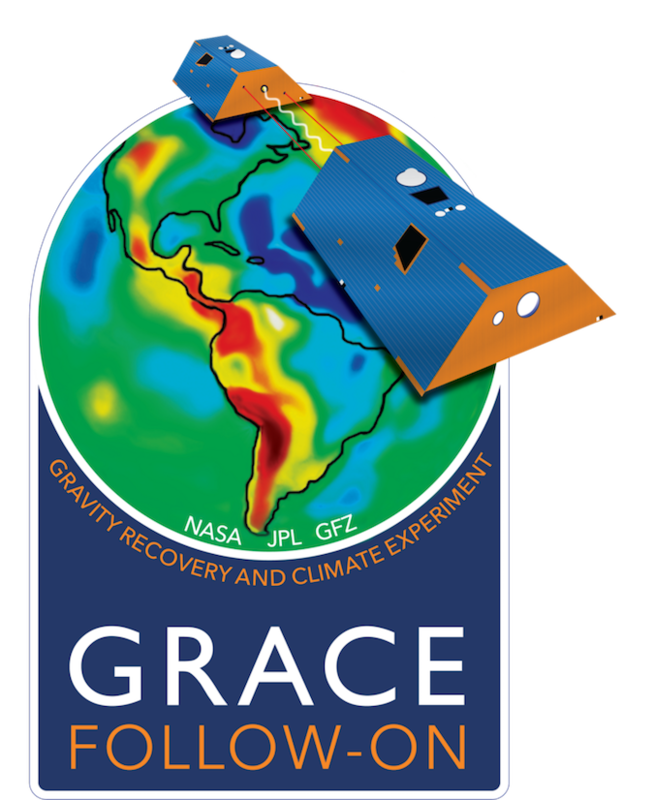 GRACE-FO is a partnership between JPL and the German Research Centre for Geosciences (GFZ) in Potsdam, with participation by Deutsches Zentrum für Luft- und Raumfahrt (DLR), the German Aerospace Center. A pair of NASA satellites landed at Vandenberg Air Force Base earlier this month, putting them one step closer to arriving in space to start collecting data about the planet. 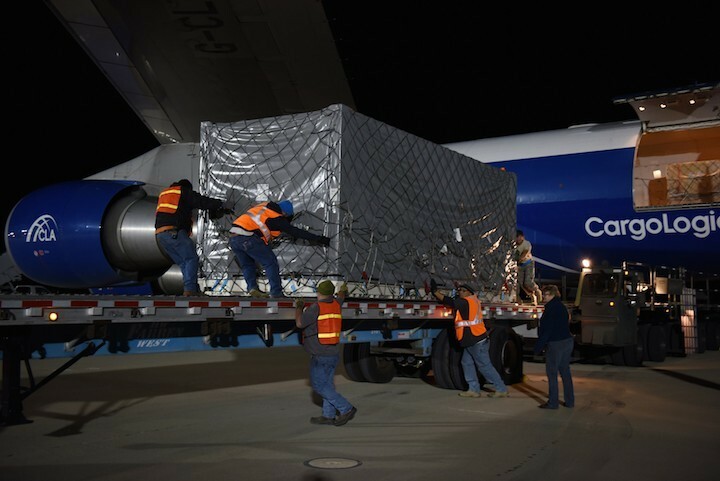 The twin Gravity Recovery and Climate Experiment Follow-On, dubbed GRACE-FO, arrived Dec. 12 at Vandenberg’s airfield aboard a cargo plane that left Munich, Germany on Dec. 11. "With this milestone, we are now in position to launch GRACE Follow-On and restart the valuable observations and science that ceased in mid-2017 with the end of the GRACE science mission," said Michael Watkins, director of NASA's Jet Propulsion Laboratory in Pasadena, and lead for the GRACE Follow-On science team. The U.S./German spacecraft will undergo processing to get ready for launch in the spring aboard a Space Exploration Technologies Falcon 9 rocket from Space Launch Complex-4 on South Base. The GRACE-FO craft will head to space aboard a rideshare mission — five Iridium Next satellites also will be tucked in the Falcon’s nosecone for the flight. Iridium Chief Executive Officer Matt Desch noted the arrival of his future satellites’ fellow riders on his Twitter page. “Our rideshare partner for Iridium-6. Great working relationship; we're looking forward to flying together,” Desch said on Twitter. Iridium Next’s fourth mission launched Friday from the base at sunset, creating a dramatic spectacle many people mistook for an unidentified flying object. The GRACE twins will extend an Earth climate data record started by what scientists call an extremely successful predecessor during a pioneering mission. The original GRACE completed its science mission in October after more than 15 years in orbit following an age-related battery issue involving GRACE-2, NASA officials said. Both satellites must operate for the science mission to occur. While similar to their predecessor GRACE satellites, the new spacecraft include advancements designed to improve reliability and mission operations, officials said. Once in orbit and operational, GRACE-FO, which is designed to operate for at least five years, will continue to track differences in the distribution of liquid water, ice and land masses by measuring changes in Earth's gravity field every 30 days. The information helps show where global groundwater resources may be shrinking or growing and where dry soils are contributing to drought, NASA officials said. GRACE-FO is a partnership between NASA’s Jet Propulsion Laboratory and the German Research Centre for Geosciences in Potsdam, with participation by the German Aerospace Center. This artist's rendering depicts NASA’s Gravity Recovery and Climate Experiment Follow-On (GRACE-FO) satellites in orbit over the Pacific Ocean. The satellites are slated to launch aboard a SpaceX Falcon 9 rocket Saturday from Vandenberg Air Force Base. Just a few weeks after kicking off a historic journey to Mars, NASA is set to jump-start another mission from Vandenberg Air Force Base — this time with an interest in monitoring the movement of water here on Earth. The Gravity Recovery and Climate Experiment Follow-On, or GRACE-FO, mission is slated to begin with the launch of a pair of satellites aboard a SpaceX Falcon 9 rocket on May 22 from VAFB’s Space Launch Complex-4E. The rocket had been slated for blast-off at 4:04 p.m. Saturday, but a spokesman for NASA's Jet Propulsion Laboratory confirmed late Tuesday night that the launch had been pushed back to no sooner than May 22. The rocket, when it does launch, is also slated to carry the latest set of five Iridium NEXT satellites as the communications company continues to fill out its next-generation constellation. The GRACE-FO mission is a joint effort between NASA and the German Research Centre for Geosciences. GRACE-FO, according to NASA, is expected to provide critical measurements that will be used together with other data to monitor the movement of water masses across Earth and mass changes within Earth itself. “Monitoring changes in ice sheets and glaciers, underground water storage, and sea level provides a unique view of Earth’s climate and has far-reaching benefits,” read a portion of a statement put out by NASA about the mission. The mission is scheduled to fly at least five years. The separate Iridium portion of the launch will mark that company’s sixth in its Iridium NEXT launch series, and the second of this year. The most recent Iridium NEXT launch occurred March 30, while the previous four were all in 2017. All of the launches have been from VAFB. Iridium has put 50 satellites into orbit through the series of NEXT launches, with another 25 still planned for deployment. The company has said that it intends to complete the constellation this year, likely with just two more launches following the one planned for Saturday. Iridium NEXT is the company's $3 billion next-generation mobile, global satellite network. The upcoming launch, if it goes off as planned, would be the first from VAFB since the May 5 InSight Mission to Mars, which was the first ever interplanetary mission to launch from the West Coast. The InSight lander is expected to arrive on Mars in November. NASA will provide coverage of the launch on NASA Television and on the agency’s website. Technicians inspect the twin GRACE Follow-On satellites and their multisatellite dispenser at the SpaceX facility at Vandenberg Air Force Base in California. The satellites were subsequently stacked atop another satellite dispenser containing the five Iridium Next communications satellites they'll ride with to orbit. Two NASA Earth-observation satellites will have to wait a bit longer to get off the ground. 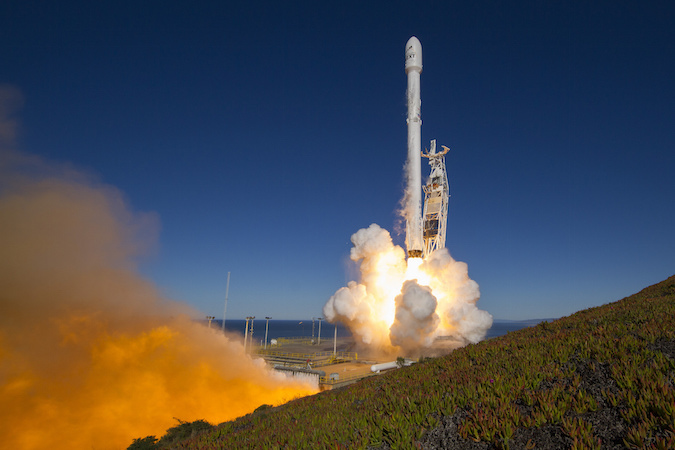 NASA's Gravity Recovery and Climate Experiment Follow-On (GRACE-FO) mission and five Iridium Next commercial communications satellites were scheduled to launch atop a SpaceX Falcon 9 rocket on Saturday (May 19) from Vandenberg Air Force Base (VAFB) in California. But the seven-satellite liftoff has now been delayed to next Tuesday (May 22). 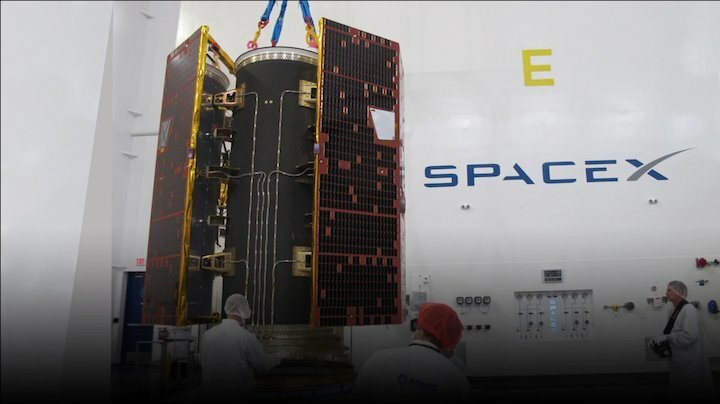 Iridium representatives said Monday (May 14) that the launch would slip by two days, to give SpaceX time to deal with a "minor processing issue" associated with the two-stage Falcon 9, according to Spaceflight Now. And yesterday (May 15), Iridium announced that range issues at Vandenberg had tacked a third day onto the delay. "Update to the Launch Update: Due to range availability at VAFB, #Iridium6/#GRACEFO is now targeting 1 day later; NET 5/22 with backup of 5/23. Instantaneous launch on 5/22 = 12:47:58 pm PDT (19:47:58 UTC) #IridiumNEXT #HereWeGo," the company said via Twitter. As its name indicates, GRACE-FO follows in the footsteps of NASA's GRACE mission, which characterized Earth's gravitational field from orbit in great detail from 2002 to 2017.